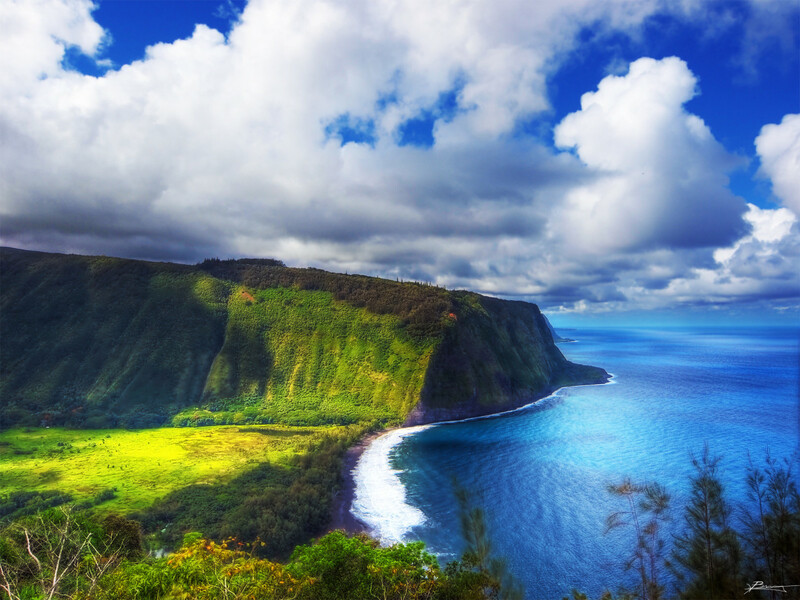 Have you ever been to the Big Island of Hawai'i? At over 4000 square miles in size, Hawai'i is the largest of the Hawaiian islands and has more acreage than all of the other islands put together. It is also the youngest of the islands. The Island of Hawai'i, commonly called the ‘Big Island’, is also known as the ‘Orchid Isle’ because of the abundance of the tropical flower that grows effusively here. The Island of Hawai'i shares its name with the entire State of Hawai'i, which can be confusing to those who don't live here. The word “Hawai'i” has sacred meaning in the Native Hawaiian language and has no literal English translation. 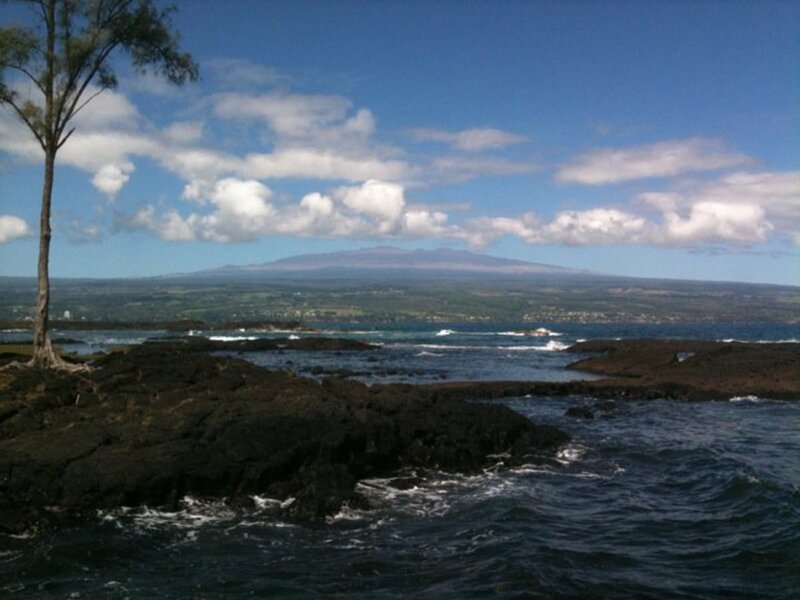 Native Hawaiians call the island—Moku o Keawe—The Island of Keawe. A chief in the 17th century, Keawe‘īkekahiali‘iokamoku, was renowned for the peace and prosperity of his reign, and forever after his name will be remembered in the traditional name for the island. Hawai'i is the southernmost in the Hawaiian island chain. It was on the southern shores of Hawai'i that the first Polynesian settlers made landfall in their outrigger canoes several hundred years after the birth of Christ. 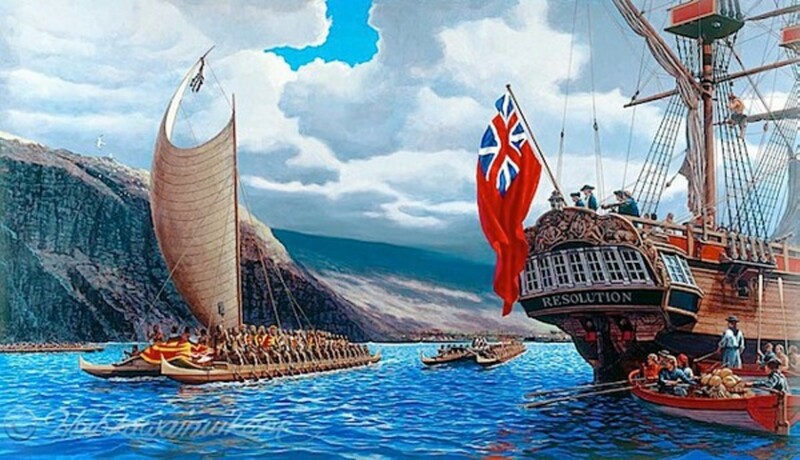 And it was into Kealakekua Bay in the island's Kona district, in 1779, that Captain James Cook of Great Britain sailed the HMS Resolution, revealing Hawai'i to the rest of the world. Notice I didn't say that Captain Cook 'discovered' Hawai'i as most of the history books say. Obviously, the Polynesian settlers discovered it because they were there when Cook landed. The artist, Herb Kawainui Kane's painting of King Kalaniopu'u welcoming Captain Cook into Kealakekua Bay, 1779. The Big Island continues to grow daily as Kilauea Volcano continues to erupt and add about 40 acres of new land onto the island each year. In January 1983, Kilauea began erupting and has continued almost non-stop ever since. What is known as the Pu'u 'O'o-Kupaianaha eruption is the largest amount of lava that has emanated from the volcano's east rift zone in over 500 years. 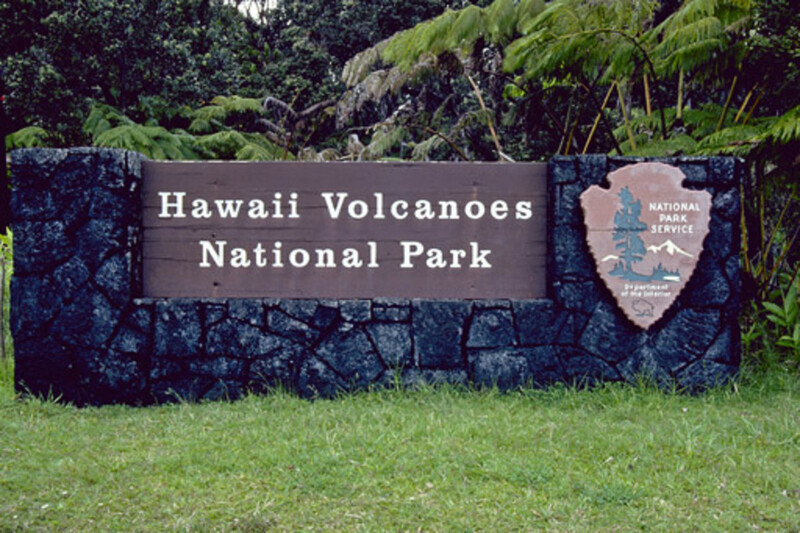 A trip to Hawaii Volcanoes National Park is a must for any island visitor, and many residents visit the park regularly for the many special events that are held there throughout the year. Before you make a trip to the park, be sure to check out their website for park hours, advisories about weather conditions or ongoing eruptions, and how you can visit the Jaggar Museum or the Volcano Art Center. There is also lodging at the national park at the Volcano House or campsites that can be reserved in advance. 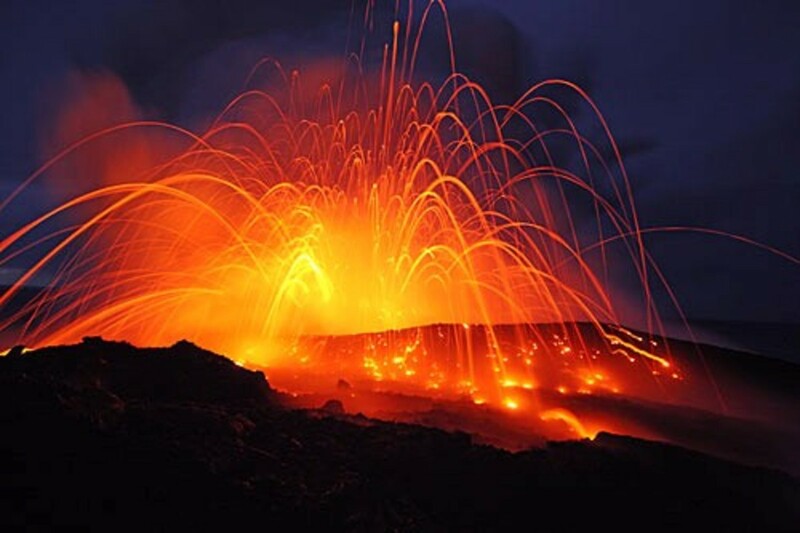 Ongoing volcanic eruptions and flowing lava are miraculous natural wonders. This is one of the best guides on how to safely view lava when you visit the Big Island: Lava Viewing Guide for the Big Island. Mauna Kea is an ever-present backdrop in Hilo. Hawai'i is such a large island that it takes 6-8 hours of straight driving to get around it without stopping. 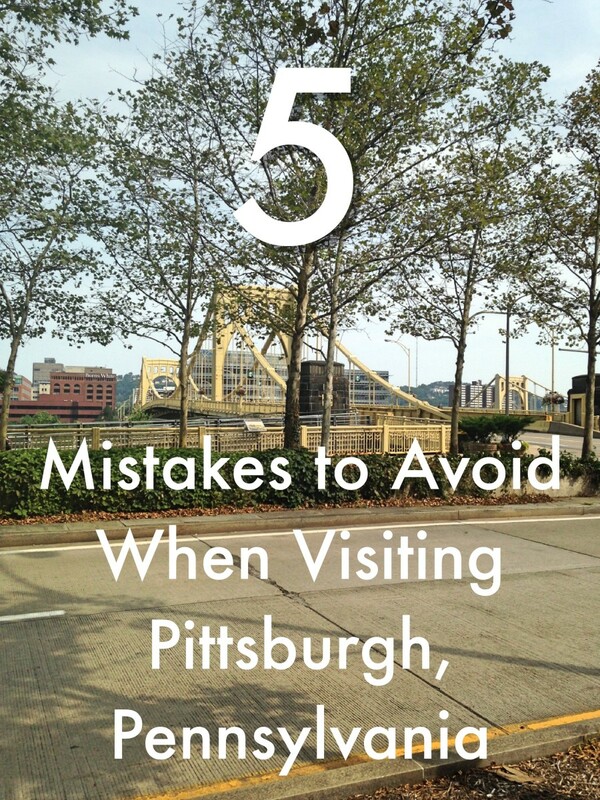 The best advice is to allow yourself at least 2-3 days to travel around the island—a week is better. Wherever you’re headed, make sure you do it in daylight because Big Island roads are not always well-lit at night in some areas and there are places where your cell phone may not pick up a signal. Hawai'i is simply a gorgeous island. Three huge mountains dominate the island scenery and slice through the island landscape. Hualalai (named after the wife of Hawai'i Loa, an ancient Hawaiian navigator). 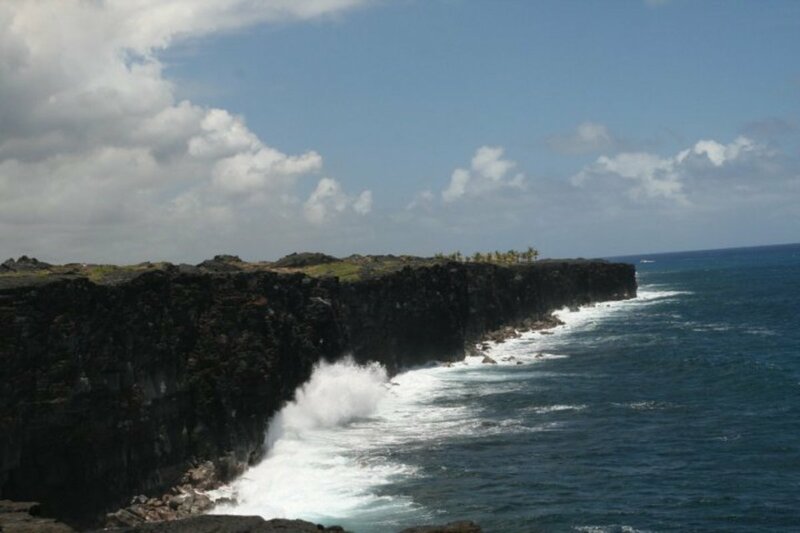 Hawai'i is so geologically diverse that on an around-the-island visit, one might experience heavy rainfall in the east, snowfall on Mauna Kea, the Ka’u desert region in the center of the island, and drought conditions in the west. 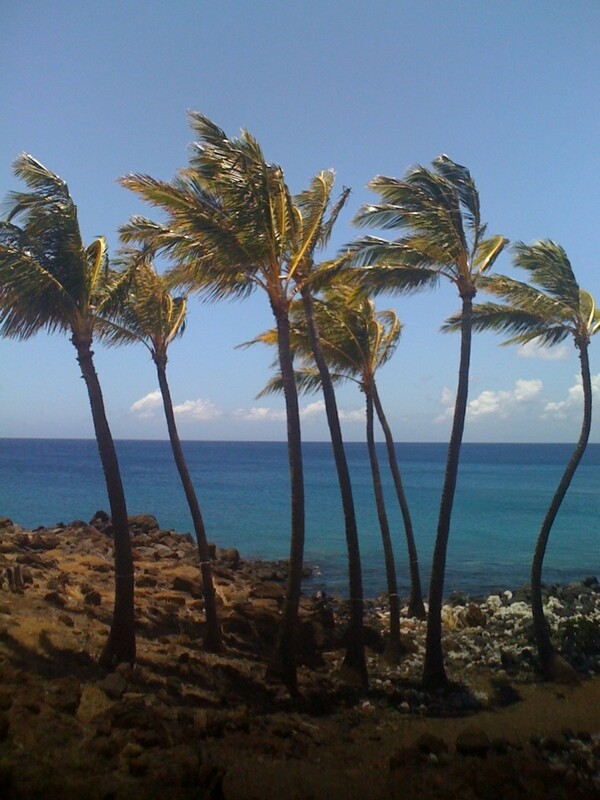 Hawai'i tends to be lush, green, and humid in the eastern Hilo side and drIer on the western Kona side. 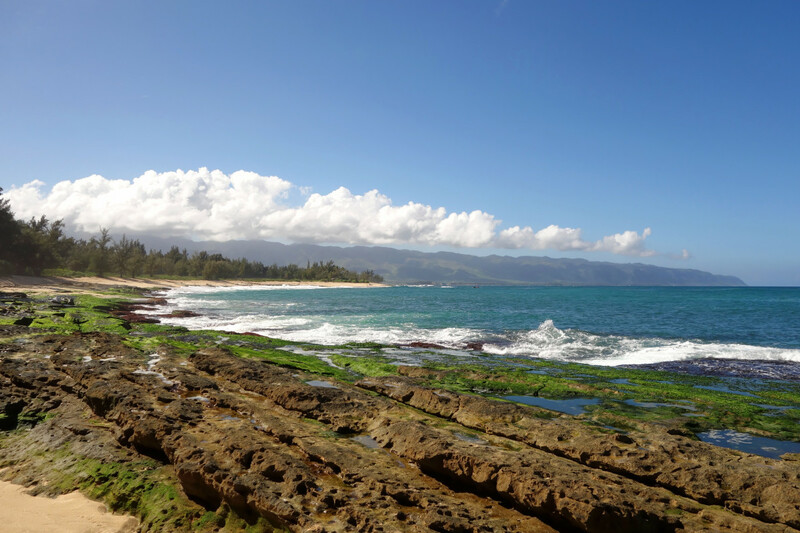 Your time on the Island of Hawai'i will best be spent reveling in the natural beauty that is everywhere. 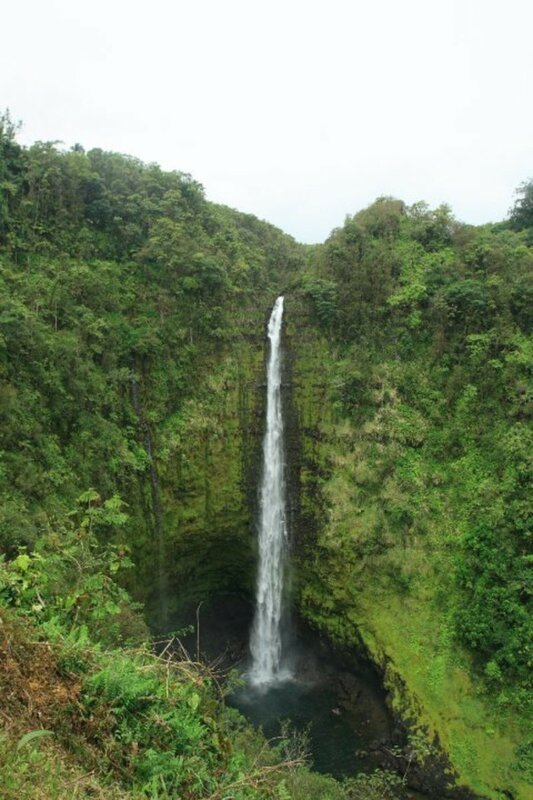 Waterfalls like Akaka Falls and Rainbow Falls. Deep valleys like Waipi'o where people still grow taro and where King Kamehameha was raised as a boy. Tropical rainforests and the Pana'ewa Rainforest Zoo with its display of tropical plants and flowers. Wonderful beaches with lava rock shorelines and sand that can be white, green or black. 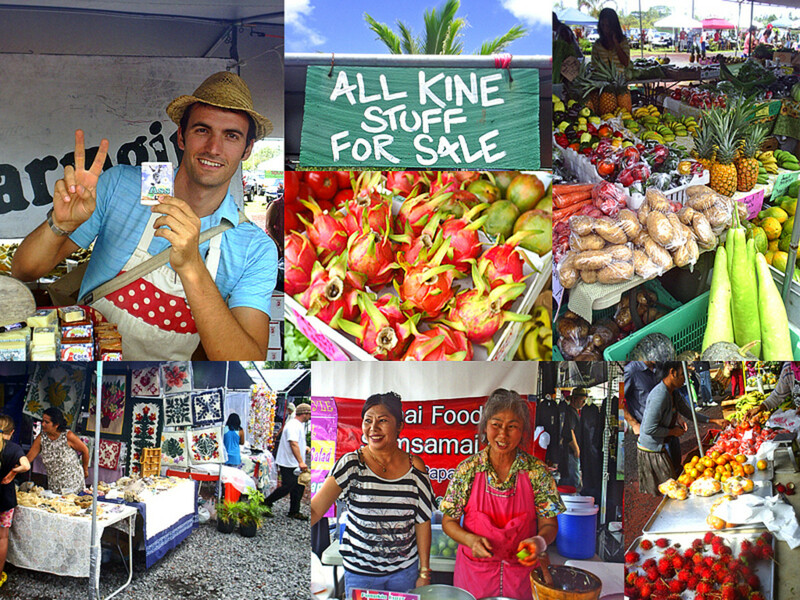 Hawai'i is known for its agricultural products. Much of the local economy is linked to growing coffee, macadamia nuts, tropical flowers, bananas, and papayas. Small farms specialize in growing vanilla, oranges, cocoa beans and cultivating honey. The people of the Big Island are hard to describe, but easy to love. They are scrappy and tenacious. 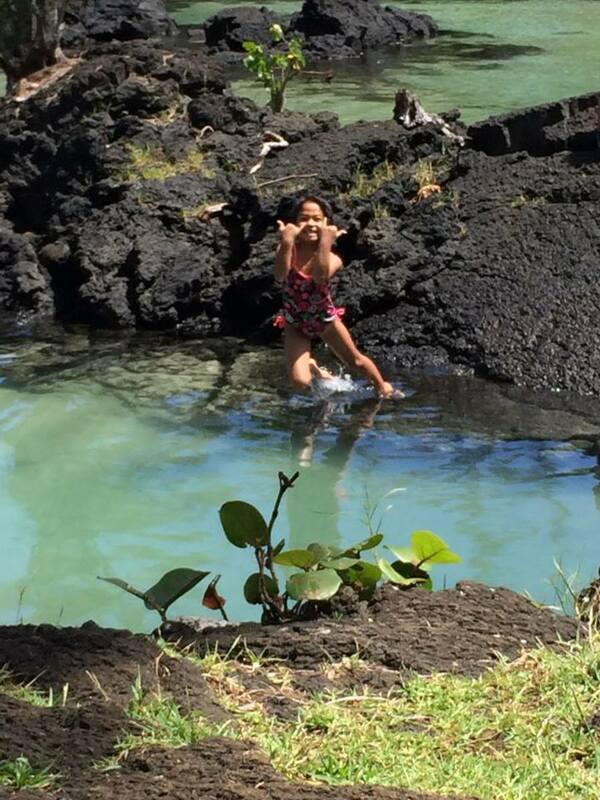 They jump into the ocean from lava-rock beaches. They enjoy life while the volcano erupts miles away.Their kids play soccer and adults run marathons in the pouring rain. Some still live "off the grid" by choice—foregoing electricity, cable TV, refrigeration, running water and flush toilets—just to enjoy a debt-free existence and a simpler lifestyle. 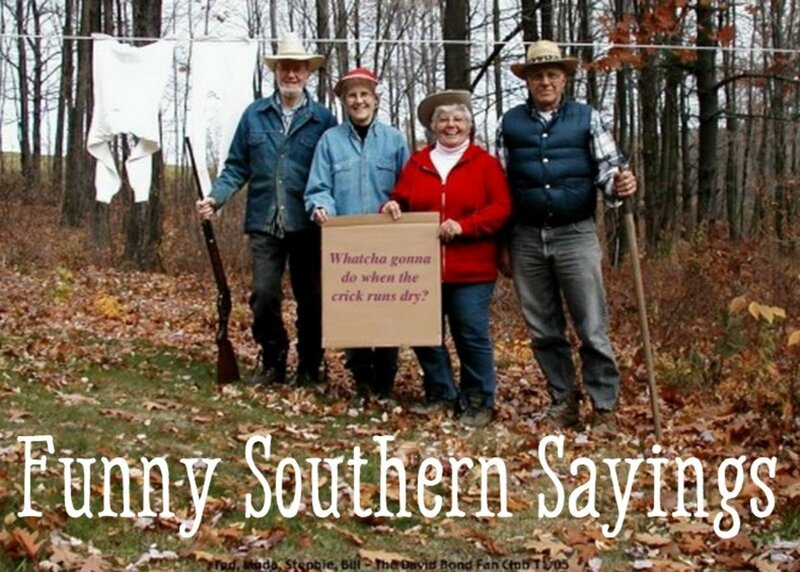 They have learned to farm on land that has the shallowest dirt and an underbelly of hard lava. The Big Island is home to the 'paniolo' culture—the Hawaiian cowboy. Nestled between Hilo and Kona is Waimea, a small town with a big cowboy heart where Parker Ranch is the largest working cattle ranch in the state. 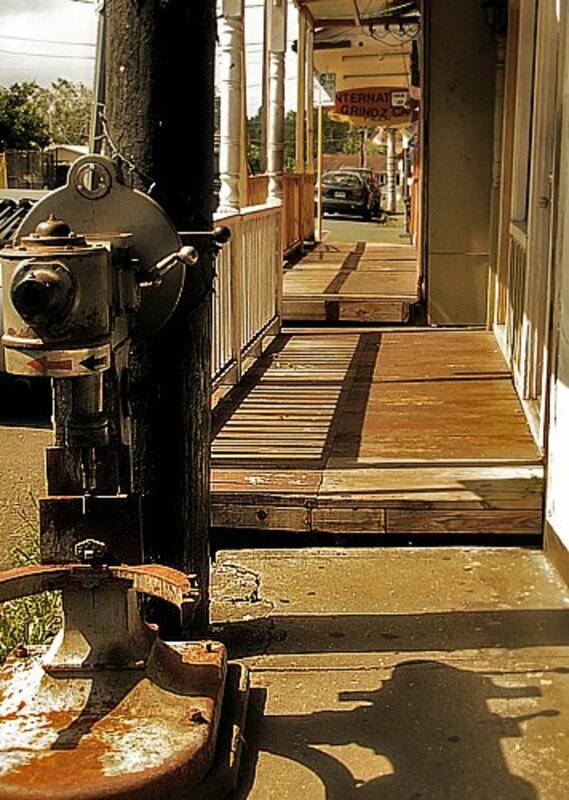 Many Big Islanders are descendants of Japanese, Chinese, Filipino and Portuguese plantation workers who lived and worked in the shadows of sugar mills that dominated island life for decades. On a drive across the island, you will still see the remnants of the old sugar mills that belched acrid smoke in towns like Pahala, Hakalau, Kea'au, Honoka'a, Hawi. They are "keepers of the flame". Many Big Islanders protest the encroachment of commercial development like the type that has taken over large parts of O'ahu. TMT—the thirty-meter telescope proposed to be built on Mauna Kea—has been a hotbed of debate between astronomers and the Native Hawaiian community who consider Mauna Kea a sacred site. You won't see high rises or freeways here. There are no Super Walmarts. And there is only one modestly-sized covered mall on the island. 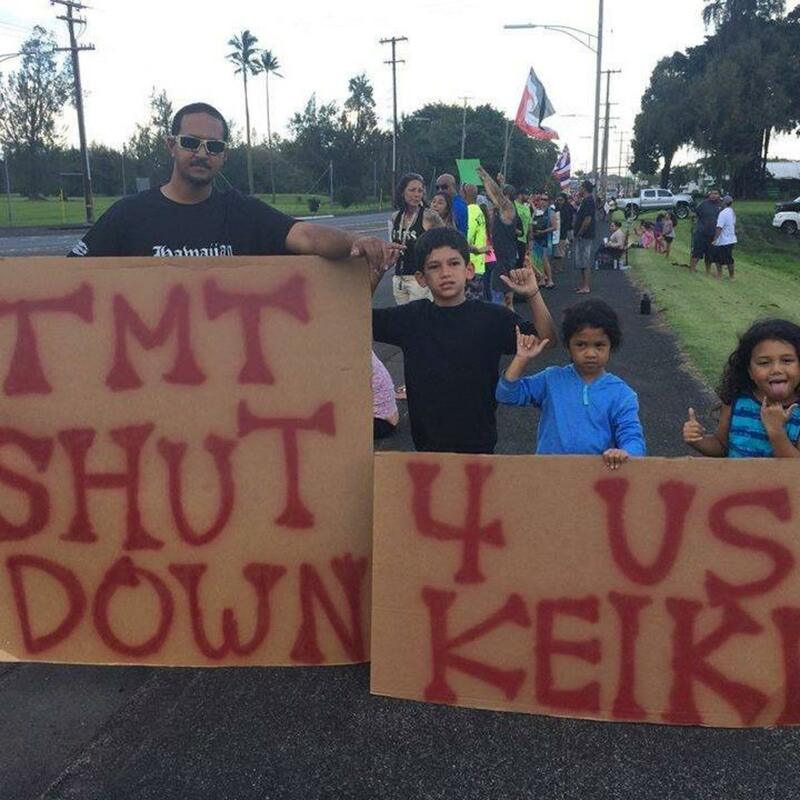 A family protesting construction of the thirty-meter telescope on Mauna Kea's summit. The modern "keepers of the flame" make sure that Native Hawaiian culture is perpetuated. 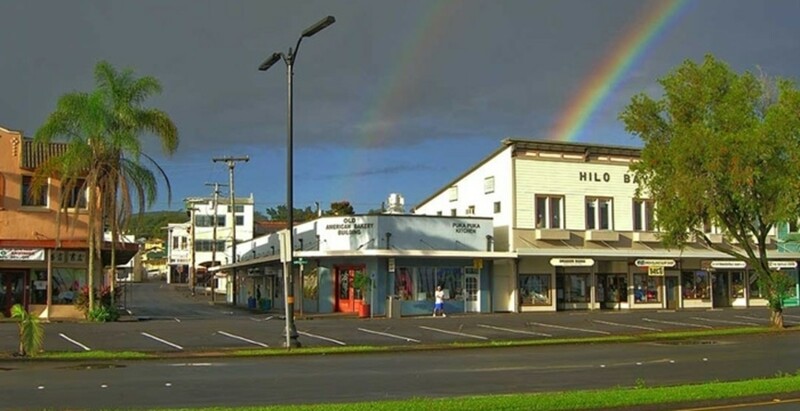 The University of Hawai'i at Hilo is well-known for its Hawaiian language program, and was the first institution in the U.S. to offer a doctorate in an indigenous language. 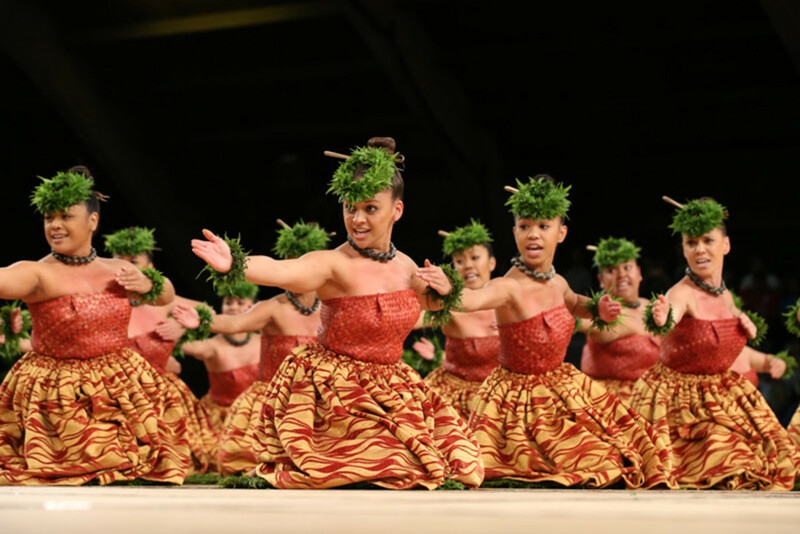 For more than 50 years, the Merrie Monarch Hula Festival has been held in Hilo during the spring. 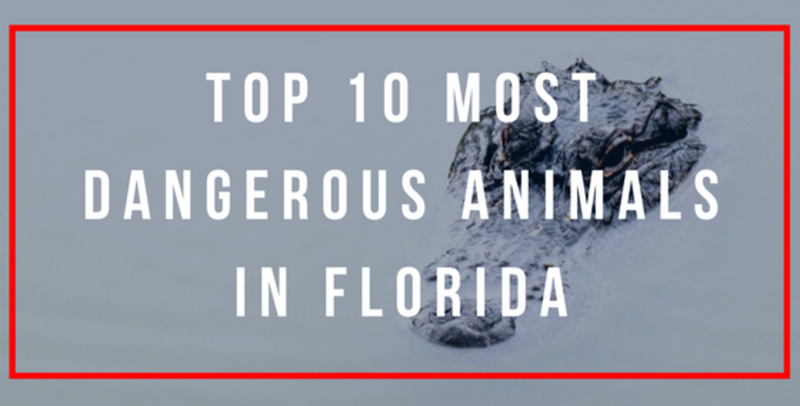 It draws thousands of visitors and is streamed live around the world. Hula schools (known as hālau) dance each year at the Merrie Monarch Hula Festival in Hilo. Edith Kanaka'ole (1913-1979) is credited with much of the re-emergence of education in Hawaiian language and culture on the Big Island. The Big Island has given birth to generations of cultural icons who have laid the path for today's re-emergence of native language and culture. Helen Desha Beamer (1882-1952), a gifted songwriter and hula master. Mary Kawena Puku'i (1895-1986), a scholar, dancer and composer. She co-authored the definitive Hawaiian-English dictionary with Samuel Elbert, and translated and published books of Hawaiian folk tales, legends and proverbs. Edith Kanaka'ole (1913-1979), dancer, chanter, composer and advocate for Hawaiian cultural education. 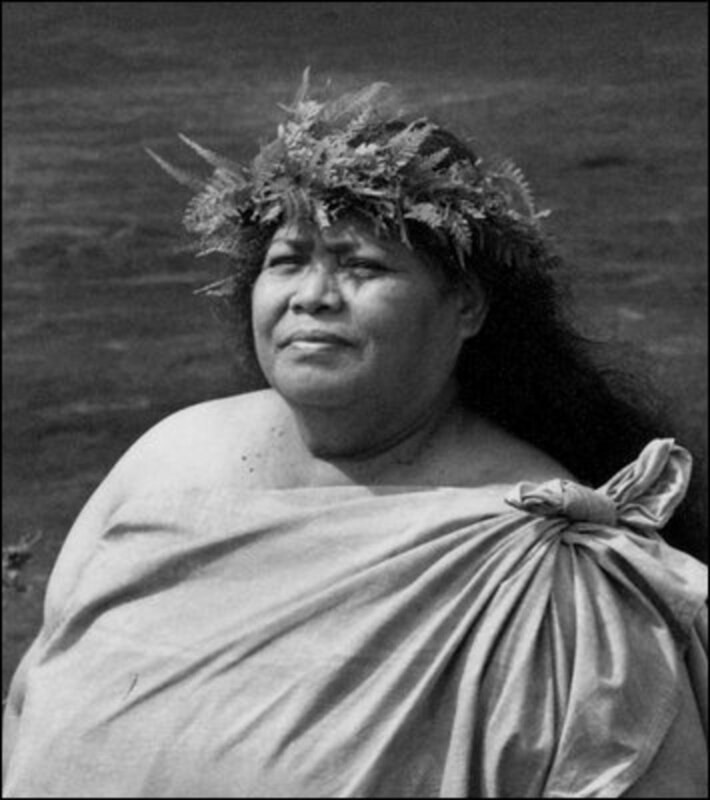 'Iolani Luahine (1915-1978) considered to be a high priestess of the ancient hula. Just like the volcano that continues to birth fresh lava, the Big Island continues to birth fresh talent in a young generation that loves their island. 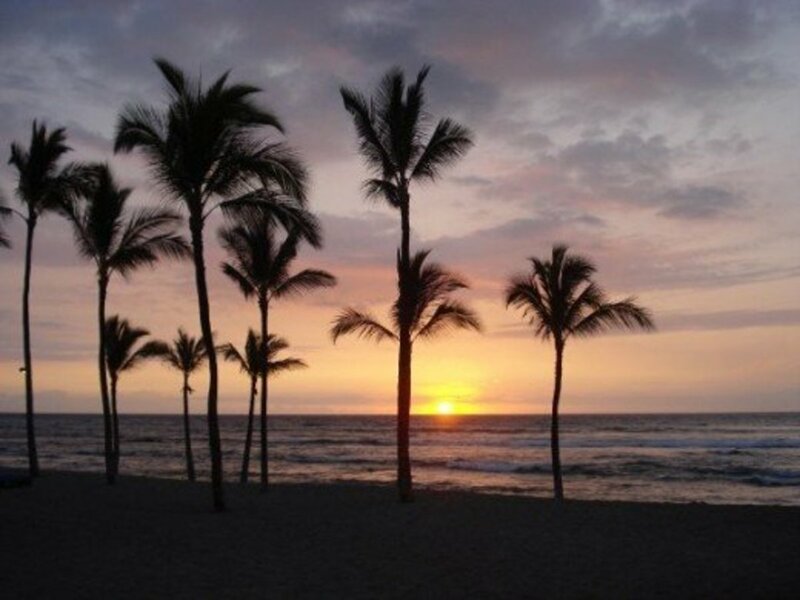 After you’ve spent time on O'ahu there is nothing city-like about the Big Island. 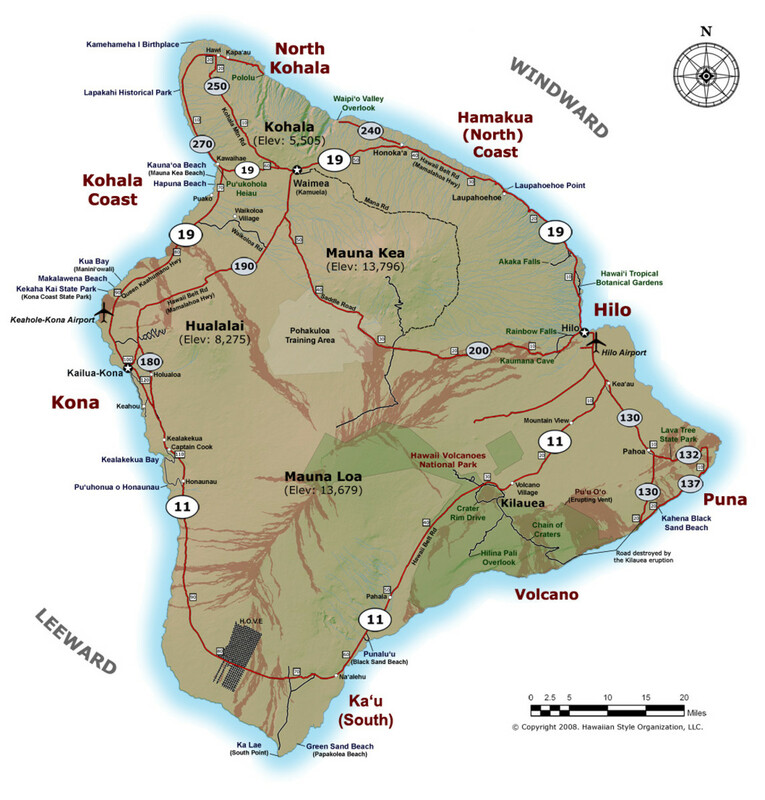 The two main towns on the island are Hilo in the east and Kailua-Kona in the west. There are decent sized airports at each location. Hilo International Airport kept the 'international' in its name even after international flights stopped. Only United Airlines has a direct flight to and from Hilo to the continental U.S. Most people take an interisland flight from Hilo to Honolulu and get on a mainland flight there to return home. Unless you are flying on United directly to Hilo, you will probably stop at Honolulu before transferring to a Hilo flight. A few airlines have flights that stop on Maui before continuing to Hilo. At the Kona International Airport, international flights come in from Vancouver, South Korea and Japan. At this writing, there are domestic flights in and out of Kona on Alaska Air, American, Delta, Hawaiian, Mokulele and United. Amazon loves the Big Island! This guidebook is, by far, the best I've read. And I have read many. Andrew Doughty was a 'malihini' (visitor) who has become a 'kamaaina' (child of the land) by living and loving Hawai'i. Whether you are visiting the Big Island or have lived here all your life, this book belongs in your car so you can be prepared for the next adventure. Mahalo Hawaiian Scribe! My Hawaiian friend used the name "Moku o Keawe" in a conversation and I didn't know why it meant. Now I know! I live on Moku o Keawe, and am an artist. I paint what I experience here on this enchanting place, like no where else on earth that I've traveled to. I enjoy learning about ancient Hawaiian culture, and what I have discovered is that the more you learn the more you find out that there is to learn! Amazing! The mythology here so rich, yet seemingly unknown to the world. We all learned Greek Mythology is school, yet here in America, we had an actual Royal Kingdom with two Royal Palaces, and a vibrant vastly dense mythology of gods, goddesses demo-gods and monsters all in the area known now as the USA. Yet our children learn nothing about it!? How strange! Aloha e Kimo, I know that vanda orchid production has dwindled compared to pre-statehood days, but there are still many beautiful orchids on the island and in the wild. I just love going home and being able to see orchids in our yard. I live in Wai'anae now; definitely not "orchid country". 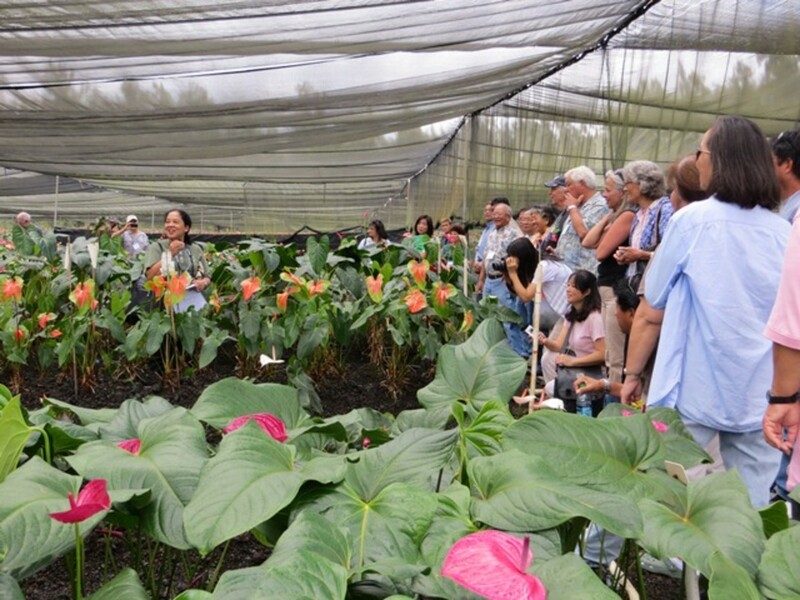 Here's a link to a blog post about the work of the Hilo Orchid Society where they are keeping the breeding of orchids alive. http://www.sandrawagnerwright.com/a-symphony-of-or... Mahalo nui loa for bringing up the important point of how commercial tourism is often a spoiler of natural beauty. 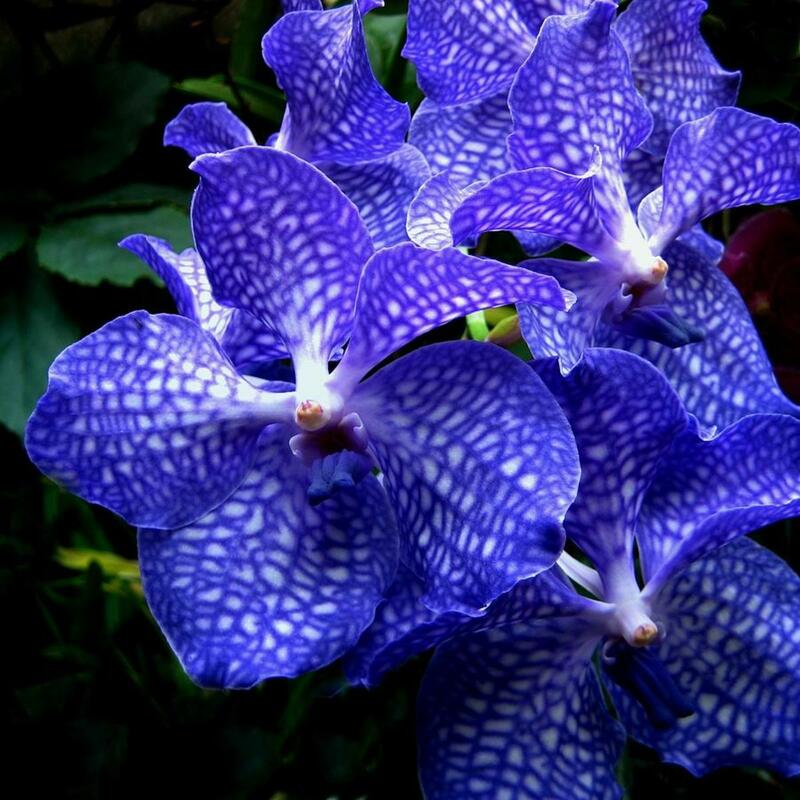 We were known as the "Orchid Island" because we on the Island of Hawai'i at one time had acres of commercial vanda orchid fields. We can no longer use that nickname since those vanda orchid fields no longer exists because of the destruction of Tourism in these islands by the Hawai'i Tourism Authority. I used to live in Honomu. I always felt that moving away was one of my worst mistakes. I would love to move back to Hawaii Island someday...dare I hope, soon? I have this dream that I will someday be able to cast my worries aside and buy a one-way ticket to "Hawai'i." I have always been an admirer from afar, as the state looks so peaceful and beautiful — truly a paradise. Thanks Hawaiian Scribe for this wonderfully written overview of your home. That was a fantastic overview of the island, thank you for sharing this with us. You have written well from your love for Hawaii. Reading your words of heart and seeing the photos brings back the feeling we had for the islands on our first stay, which was for almost three years. The spirit of the Big Island was highly supportive at that time for us. We have warm memories. The beautiful and remote Hawaian islands to me are the most fascinating islands on the planet! I can imagine how the first people got to these islands and what they must have felt, it must have been one of the greatest discoveries in history. Gorgeous! Hawaii is definitely on my list of places I would like to travel to!